At Sikh Temple, Leader Attacked Gunman; Died Trying To Protect Others : The Two-Way Satwant Singh Kaleka went after the gunman with a knife, authorities have told his son. That likely slowed the attacker enough to let others flee to safety. Kaleka, though, was gunned down. Satwant Singh Kaleka, in an image broadcast by Milwaukee's TMJ4-TV. As happened after last month's shooting rampage in Aurora, Colo., we're starting to hear stories of courage and sacrifice about victims of another mass shooting. This time they're about those who died Sunday at a Sikh temple in Oak Creek, Wis., where authorities say a gunman killed six people and injured three others before being stopped by police. The suspect, since said by sources to be named Wade Michael Page, was shot and killed by an officer. This morning, Amar Deep Kaleka said on Milwaukee's TMJ4-TV that he's been told his father died doing his best "to protect the temple, his family, his wife and all his friends." Police have told him, Kaleka said, that Satwant Singh Kaleka "attacked the intruder or the shooter in the lobby [of the temple] after gunshots were fired." The elder Kaleka used a knife, authorities have told the son. Blood trails, said Amar Deep Kaleka, indicate that the gunman was "slowed ... enough so that other people could get to safety." "It's ... exactly who he was," Amar Deep Kaleka said. "There was no way on God's green earth that he would allow" the gunman to attack those at the temple without being challenged. Satwant Singh Kaleka was the Sikh Temple of Wisconsin's president and one of its founders. He "brought everyone together. He just wanted to make a good temple, a good community," temple member Lahwinder Singh tells Milwaukee's Journal Sentinel. 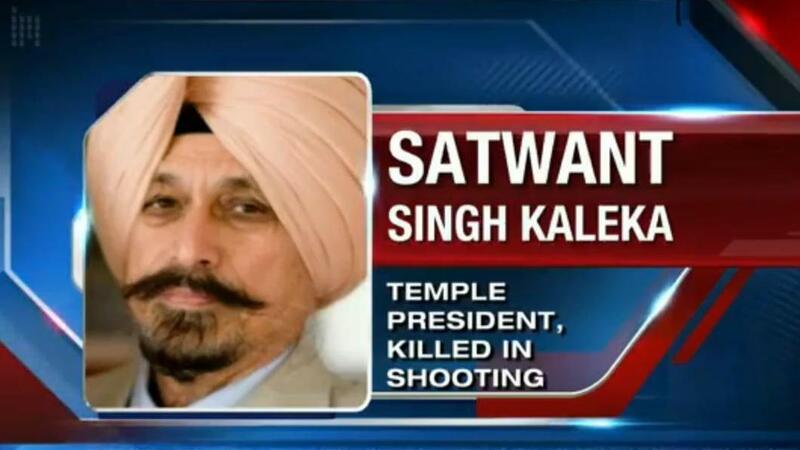 Also among those killed, according to the newspaper, was Parkash Singh, one of the temple's priests. Those who knew him, writes the Journal Sentinel, say Parkash Singh embodied the last words that end Sikh prayers — "we wish peace and joy to all the people in the world."